Where Did That Black Hole Come From? Medium-size black holes actually do exist, according to the latest findings from NASA/ESA Hubble Space Telescope, but scientists had to look in some unexpected places to find them. The previously undiscovered black holes provide an important link that sheds light on the way in which black holes grow. Even more odd, these new black holes were found in the cores of glittering, 'beehive' swarms of stars called globular star clusters, which orbit our Milky Way and other galaxies. 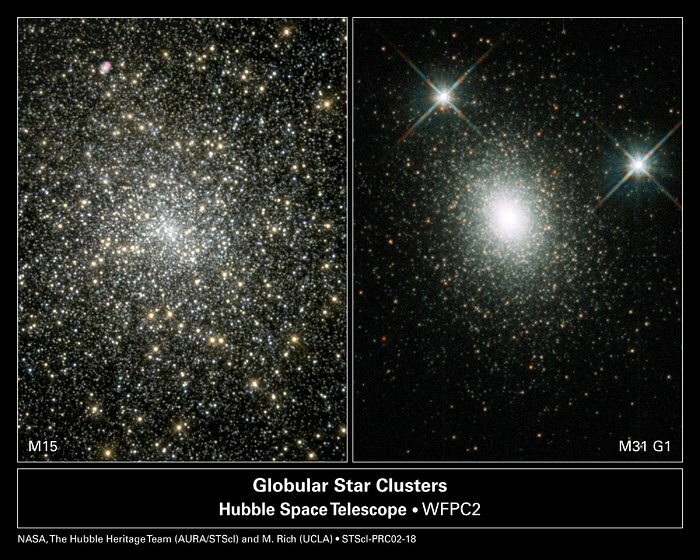 The black hole in globular cluster M15 [left] is 4, 000 times more massive than our Sun. G1 [right], a much larger globular cluster, harbors a heftier black hole, about 20, 000 times more massive than our Sun.